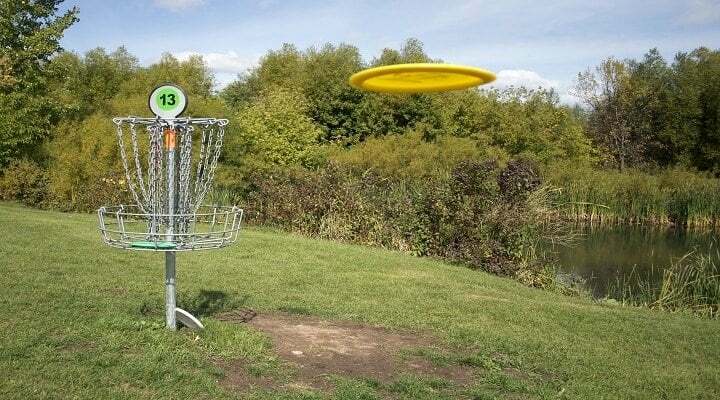 For this article we’ll be talking about which disc frisbee golf basket goals are the best to buy. We’ll be focusing on these baskets: MVP Black Hole Pro-24 Vs Titan Disc Golf Catcher Vs Innova DISCatcher Traveler Target Vs Franklin Sports Disc Golf Target. For any golfer, it is essential that have a good putting technique and the key to make it sharp is to constantly practice by using a golf basket. When it comes to buying a practice basket, it varies depending on how much you intend to spend and how you want to use it. Are you going to use it for tournaments and leagues? How often do you need to move it around? These are just some of the questions you need to ask. 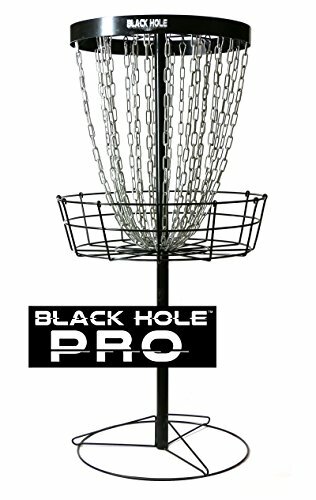 The MVP Black Hole Pro 24 features a slim design and a heavy gauge chain which is almost like the professional baskets you see in golf courses. It has a narrow focus of chains that requires accurate putt whenever you use it for practice. One of the main strengths of the Black Hole Pro is that it is designed to give you that putting experience even when you are not in the golf course. 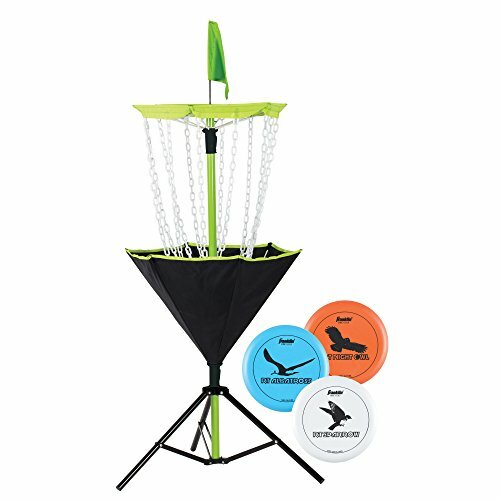 A simply yet classy design, the MVP Black Hole Pro-24 Chain Portable Disc Golf Basket Target is slightly more expensive compared to others but it is definitely a great choice. The Titan Disc Golf Catcher Basket is portable and very easy to assemble. The base is removable and depending on your playing needs, you can also set it up permanently. One of the main strengths of this golf basket is that it comes with thick chains that can catch power shots even from up close. You can just use pliers to close the S hooks so the chains are secured. With its lightweight design and robust design, you have golf catcher basket that can last and at the same time easy to transport and to store. The Innova DISCatcher Travel Target is designed in such a way that you can use it even in varying terrians. From mountain trips to camping adventures, it features a lightweight design which makes it very easy to set up and to remove. One thing you will like about Innova is that it is the type of basket that you can use even when you are on the go. If you want to use it at home, put can put it in your backyard for your putting practice. The price is slightly expensive, but considering its built and how it is designed, it allows you to play on almost any surface. Designed for practice or even for a competitive play, the Franklin Sports Disc Golf Target features a Quickset frame design. This allows you to set it up in just a matter of seconds which makes it very convenient to use. It has an umbrella design that enables you to use it on various surfaces. For easy storage and convenient transport, it comes with a carry bag. Whether you need a disc golf target that you can use for backyard, tailgate or even for the beach, you can never go wrong with this choice. The package comes with 3 golf discs. Compared to the previous disc golf baskets, the GlowCity offers more creative features with its nice waterproof Pod lights. For each light, it comes with 10 LED lights that change colors. 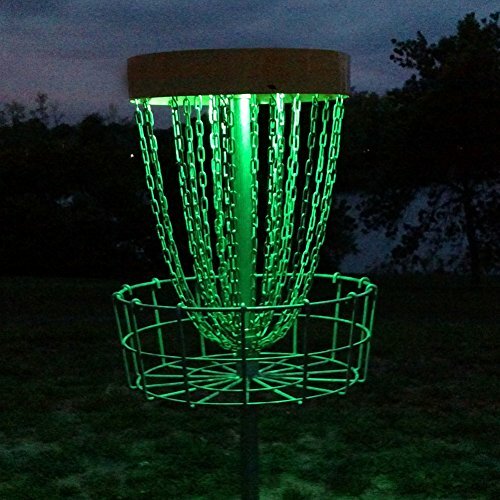 This takes playing disc golf to a new level of gaming experience since you can now play at night with the all the lights around it. What you will like about this choice is that you can change the colors depending on your preference. You can use the remote control feature to change the colors, mode and even adjust the brightness. The lights are easy to store and you can stick them on the basket. A great accessory addition to golf baskets..
Foldable: Easy to transport and can easily fit inside a bag, this type of basket collapses down which makes it a good choice if you need a golf basket that you can use at home or elsewhere. Light Duty: This type of basket features a slimmer design. It is much more lightweight and less expensive compared to other options. Heavy Duty: If you are looking for professional baskets, heavy duty golf basket is the one to get as it has high success rate. It is perfectly suitable for home use or even for professional use. Narrow Target: For those who are searching for a basket that can help them fine tune their putting technique, this is the one to have. Disc golf is a great hobby even if you don’t plan on doing it competitively.